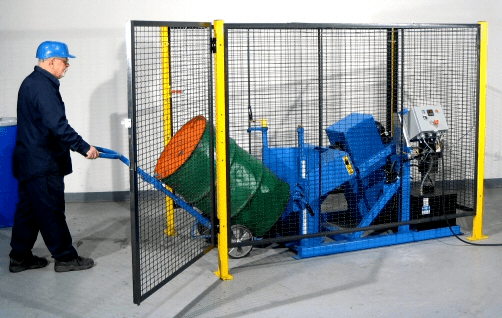 Tilt-To-Load Drum Tumblers with the advanced factory-installed Automated Control Package to automatically lift your drum, rotate for the time you set, and then return it to upright position at floor-level for easy handling. 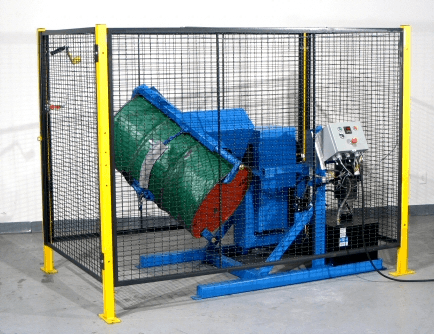 The built-in safety interlock on the enclosure automatically shuts off the drum rotator when the gate is opened. Watch the video to see how it works. Set the desired time of drum rotation anywhere from a few seconds to 16 hours, push the start button, and walk away. You preset the tumbling speed from 5 to 20 RPM. 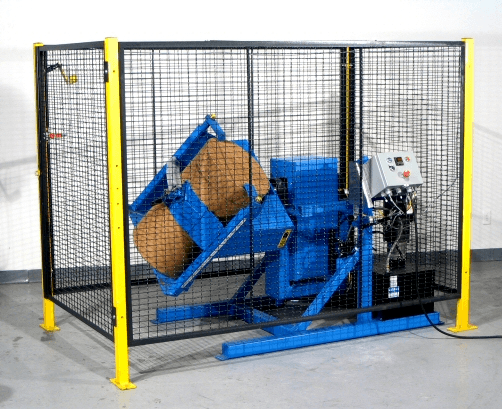 The enclosure has an integrated safety interlock, in accordance with OSHA requirements, so the machine automatically shuts off when the enclosure is opened. In case of any problem during operation, the tumbler can be interrupted by hitting the red emergency stop knob. Tumble a steel, plastic or fiber drum from 29" to 37" tall, and from 18" to 23.5" in diameter. L88" x W52" x H63.25"
a web strap and ratchet around drum. 400 Lb. (181 kg) half-full drum. Half-Full Drum Rating is an indication of the capacity for tilting an unbalanced, bottom-heavy drum. A partially full drum with an unbalanced and shifting load is harder to tilt than a full drum. 311-1-115 1 115 60 23 * 1136 Lb. (516 kg) L77" W62" H62"
311-1-230 1 230 60 11.5 1105 Lb. (502 kg) L77" W62" H62"
311-3-230 3 230 60 5.0 1136 Lb. (516 kg) L77" W62" H62"
311-3-460 3 460 60 2.5 1071 Lb. (487 kg) L77" W62" H62"
311-3-575 3 575 60 2.0 1136 Lb. (516 kg) L77" W62" H62"
311-1-220-50 1 220 50 9.7 1136 Lb. (516 kg) L77" W62" H62"
311-3-230-50 3 230 50 5.0 1136 Lb. (516 kg) L77" W62" H62"
311-3-400-50 3 400 50 2.9 1136 Lb. (516 kg) L77" W62" H62"
* Requires 30 Amp circuit, and can have amp spikes higher than that. 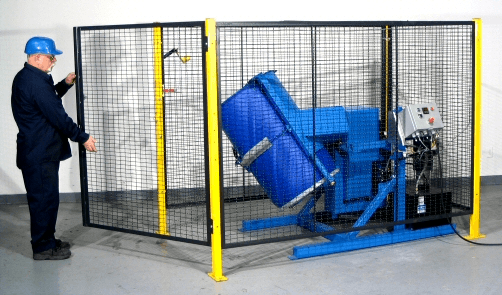 Morse Tilt-To-Load Drum Tumblers with the advanced factory-installed Automated Control Package to automatically lift your drum, rotate for the time you set, and then return it to upright position at floor-level for easy handling. 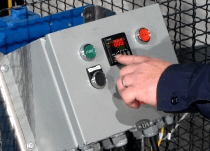 The built-in safety interlock on the enclosure automatically shuts off the drum rotator when the gate is opened.